The Moonstone, a mystery novel written by Wilkie Collins, is one of the best mystery novels I have read so far. Collins did an amazing job of creating tension and suspense, and at the same time, keeping its originality. 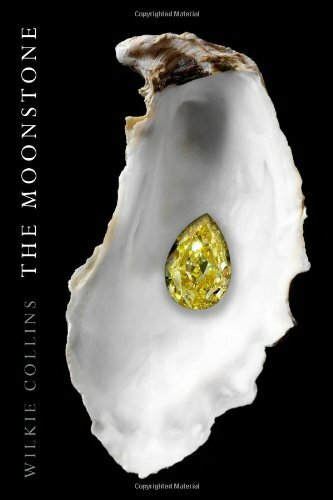 In the beginning of this classic novel, the Moonstone, a large, yellow diamond said to have mysterious lunar influences, is stolen from the head of an idol in the Palace of Seringapatam. John Herncastle, a dishonorable man and the one who stole the Moonstone, has left it to Rachel Verinder, daughter of Lady Verinder (born Julia Herncastle), as a gesture of malignity since the diamond is said to be cursed. The story then shifts the mid-1800’s on the day of Rachel’s eighteenth birthday. The Moonstone is delivered to Rachel by Franklin Blake, Lady Verinder’s nephew. During her dinner, Godfrey Ablewhite, a philanthropist and Rachel’s cousin, arrives to the estate and proposes marriage to her. Clearly in love with Blake, she turns Ablewhite down and continues with the dinner. When the dinner was over, Rachel goes to sleep; she leaves the Moonstone in her sitting room. The next morning, the Moonstone is missing and every person at the dinner last night was named a suspect, but the main suspects were Blake, Ablewhite, and three mysterious Brahmins who were lurking around the estate. The investigation was calm and organized, that is, until Ablewhite is found dead. The Moonstone is one of the longest and most suspenseful mystery novels I have read. I like the way Collins puts twists and turns in the plot so the true suspect is never actually revealed until the end of the story. I really enjoyed this novel. I would definitely recommend this book to people who enjoy mysteries.